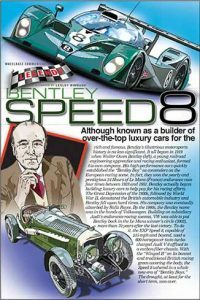 Although known as a builder of over-the-top luxury cars for the rich and famous, Bentley’s illustrious motorsports history is no less significant. It all began in 1919 when Walter Owen Bentley, a young railroad engineering apprentice and racing enthusiast, formed his own company. His high-performance cars quickly established the “Bentley Boy” as contenders on the European racing scene. In fact, they won the yearly and prestigious 24 Hours of Le Mans (France) endurance race four time between 1923 and 1931.